If you get bit or scratched it’s over. There ain’t a medical kit on the planet that’s bringing you back. Still, there are plenty of incidences where having a medium medical kit will serve you. Just surviving is a lot of strenuous work. Whether we are talking about getting food, water or just trying to get a good night’s sleep. The woods are never quite enough, I know. 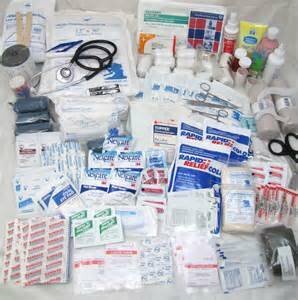 Your medium sized medical kit must be able to handle lacerations. Your skins gotta heal quick. They smell you. Look at this list of contents for a basic medium sized medical kit. Your kit also needs to handle things like fevers, diarrhea and even allergies. Make sure these meds are available as well. Add some personal hygiene tools to your kit as well. My recommendation to you, the zombie survivor, is the waterless hygiene system made by Combat One because it’s the choice of special ops soldiers. They can track your stink!